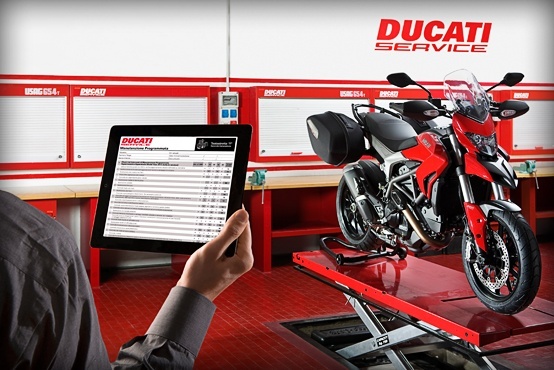 Ducati Manchester is part of the official Ducati Service Network. This means our factory trained technicians have the skills and tools needed to carry out all those fundamental procedures that will ensure your Ducati continues to perform at the highest level. Ducati Factory recommended service intervals of 15,000 miles and on some models the main Desmo Service is not necessary until 18,000 miles. Oil Service, have been spaced out to 7,500 miles or 9,000 miles. If you are unsure of your scheduled maintenance intervals for your particular model, just give us a call. Lubricating efficiency inside the engine is restored and key checks are carried out to ensure optimum efficiency of the bike. After a season of miles and enjoyment, certain parts of your Ducati that are subject to wear and tear need attention (e.g. brake pads) and your bike needs a check-up to maintain levels of performance. The most important operation to check that the bike is in the best working condition, with the engine also undergoing close inspection. If you need assistance following an accident we can provide advice and liaise with your insurance company to close matters as quickly and efficiently as possible. As an official Ducati Store we also have direct access to genuine Ducati parts and accessories at the best prices in the UK. Recovery can also be arranged if necessary. At Ducati Manchester our goal is to get you & your Ducati back on the road as quickly as possible. Contact us today for more information and latest special offers on servicing.